The Goat - Pro Ambitions Hockey, Inc.
Oct 24 Hockey Tip of The Day. “It’s a pretty sore spot, to be honest with you. He wasn’t treated very kindly by the Head Coach.” -Tom Brady Sr. talking about his son’s time in Ann Arbor. We all go through it at some point or another. Don’t let one coach define you. I have been there myself. My college coach told me I would never play in the NHL. “He had some difficult challenges because of the position I put him in.”-Coach Carr U Mich. Everyone is human. It takes a strong person to admit their mistakes. Many people in power or coaches would never make that statement. If a parent calls us and we have their child in the wrong group. We apologise and fix the problem for example. Even if their child may be a little over his or head in the higher level group at camp. If they want to try we want to give them that chance. No egos at Pro Ambitions. I always say it but we are there to help with unbiased sets of eyes. No agenda. I make sure that is our mission to give your child the summer hockey growth spurt.I am a parent, a former player. I get it. “You’ve gotta go out and make it about the way you play Tommy. 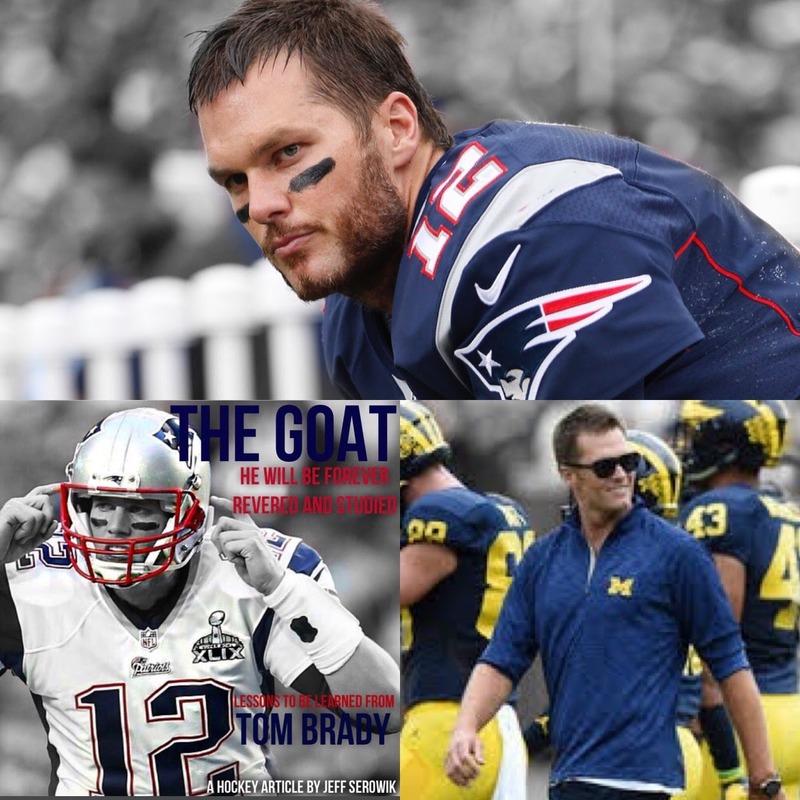 Not the way the guys ahead of you are playing, not the way your running back is playing and not the way your receiver ran the route.” – The way Tom Brady recalls his meeting with Coach Carr when he was thinking of transferring out of UMich. I love it that he went in to talk to his coach. I sent an article about this as one of the Tips of The Day this past month. It will clarify a lot. I love it when kids come and talk to me about their playing time. Players feel better. Coaches should feel better. Players know where they stand and what they need to do to get off the bench. Go and respectfully talk to your coach if you want more playing time. ” I am going to prove to you that I am a great quarterback.” -Tom Brady to Coach Carr. He did not give up. No situation is perfect. His was far more than less than perfect. He decided to face it head on and not give up. I always say Winners are Losers who don’t give up. It happened to me. 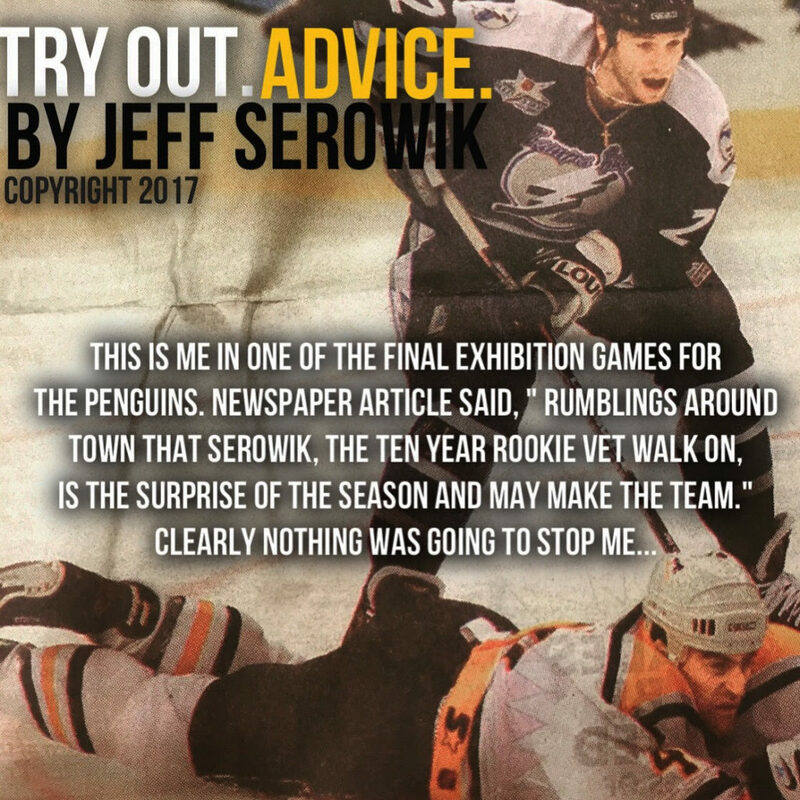 When I made the Penguins after trying for ten years to gain a regular spot in The NHL, it was with the worst odds I had ever had. For the first time in my professional career I entered training camp without a contract. I was forced to attend the rookie camp prior to the regular NHL camp. I was with a bunch of kids. I was a ten year rookie? It was embarrassing. I did not care. I decided a small chance was better than no chance. I did not care that I won The Eddy Shore Award making me the best defenseman in the AHL. Who cares. If the Pittsburgh Penguins cared enough to call my agent and invite me to a rookie camp. I am going. I went…I was ready. I was prepared. My decade long prepartion took away my nervousness. I made the team. Draft Day 2000. ” It just a tough day. You know…I just remember being there with my Mom and Dad. (holding back tears)Sorry about that. You know they were so supportive of me. And they take it as emotional as I do. Finally, The Patriots called and I was so excited. I dont have to be an insurance salesman. So uh, my family was there, we were all excited. And Thank God I was picked here.” -Tom Brady. I get it. We all do. He thought there was interest in the second round and third round teams but his name wasn’t called until late in the 6th round. I remember when I was playing for the Blackhawks organization. I called my wife with a similiar choked up voice. I had the leading points on the team in Indy (AHL) by a longshot, best plus minus, most hits, and another guy was called up because he was a draft pick in a higher round and they had to justify their pick. He never made it in the NHL. This happened to me a lot. Even though I produced for some reason or another I wasn’t the first call up regardless of my statistics and my performance. It was defeating. But once again I will say it. Winners are losers who don’t give up. Most do because it is too damn hard. “Tom was drafted. (stoic but choked up)”- Tom Brady Sr. A note to parents who get emotional as Tom’s were on his draft day or on many occassions before that I am sure. I am a parent and my wife and I get choked up when we see the disappointments our children go through. It is so hard. I am just like all of my campers parents who care, I am no different. My wife can relate on a wive’s level to a professional athlete, that is another but similiar facet of caring and hurting if a loved one is hurt or defeated. Parents of kids who make it to the pros are actually no different than parents of youth sports. All of the feelings are the same. I love Tom’s story though because what he has accomplished is no short of remarkable. We have all watched the same Super Bowls. The same games that he has pulled off the clutch play when all the odds were stacked against him with seconds left on the clock. As I said in the title of the article he will be revered and studied throughout history. He never gave up and proved everyone wrong. Over and over again. THE GOAT. I honestly don’t want to offend campers and families who are not New England fans. Even if I was not a Boston guy though, I would be a Brady fan. But I get it you gotta be loyal to your team. In closing, I have been reading Brady’s TB12 book. I cannot recommend it higher. So much great sports and nutrition advice. It is awesome. You can purchase on the TB12 website. Great for parents and kids. SALE IS ON, the last week.